Want to send your iPhone to repair? Before sending the iPhone, it is advisable to erase all content and settings on iPhone. It is important to wipe it clean and erase all data including messages, photos and files in order to be sure that your data is well protected. However, it is important to note that there are several ways that can be employed in erasing contents and settings on your iPhone and this article will look at some of the ways. Every iPhone has a “reset settings” function. What this simply means is that it will reset the settings on your iPhone to its original state, meaning your iPhone will erase all exiting content and settings . It is important to note that unless you are selling the phone, you may not need to erase all contents and settings on the phone. 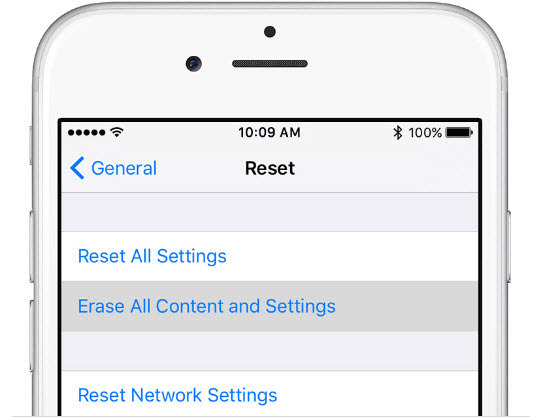 Cleaning your iPhone through the “Reset Settings” option takes just few steps. Go to Settings > General > Reset > Erase All Content and Settings. The “Reset Settings” on your iPhone does not in any way erase any app but may erase the preferred settings on them. Therefore, it is always advisable to write down your preferred settings somewhere so as to know where to change them when using the “Reset Settings” option. While a “Reset Settings” option will erase all content and settings on your iPhone, it is important to always back up your files in case of clicking the wrong button. Is There Any Bad Effect of “Reset”? Make no mistake, a factory reset on your iPhone will bring it back to its initial settings. A hard reset will erase all content and settings on iPhone, but will not be enough to ensure that your data are safe when deleted. This means that the data erased through a hard “factory reset” can be recovered by using professional iPhone data recovery software. The truth is that the factory reset does not permanently erase your iPhonedata and as such does not enhance privacy since data erased can be recovered especially if the phone is sold. iMyFone Umate Pro or iMyFone Umate Pro for Mac is one of the best tools to completely overwrite the original contents of your iPhone to make it permanently deleted. It utilizes 4 “erase mode” to delete your various data permanently. With this software, you can be rest assured that your data will not get into the wrong hands especially even if the phone is sold or even if iphone data recovery software is used on it. Any data erased by the Umate Pro is permanently deleted. Erase Private Data: This option will scan and find all your existing private files. You can preview and select any of the files and erase them. 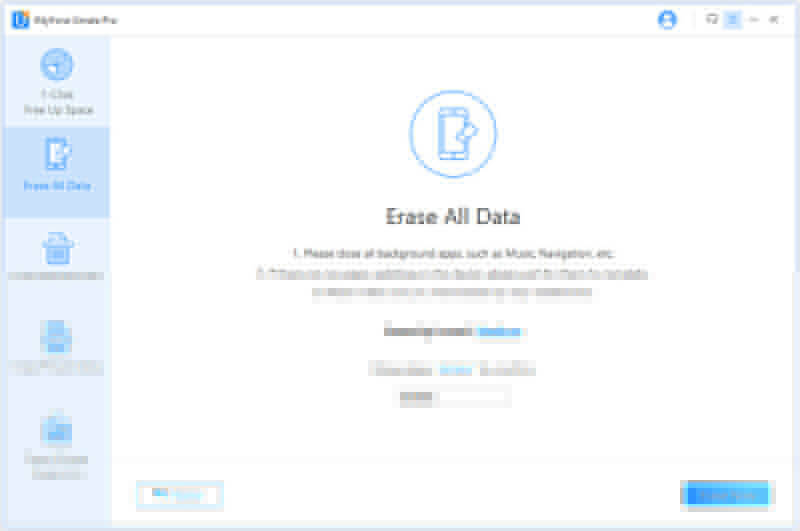 Erase All Data: While the iPhone setting “Erase all” can erase a data which can be recovered later, the Umate “Erase all Data” mode will delete data and it cannot be recovered. Step 1: Download and run iMyFone Umate Pro on your computer, then connect your iPhone. Step 2: Choose the mode "Erase All Data". Step 3: Scan your iPhone, after the scan is finished, start erasing the data. You can selectively choose what files to erase on iMyFone Umate Pro, but if you reset your device for Settings, you have no chance to choose. 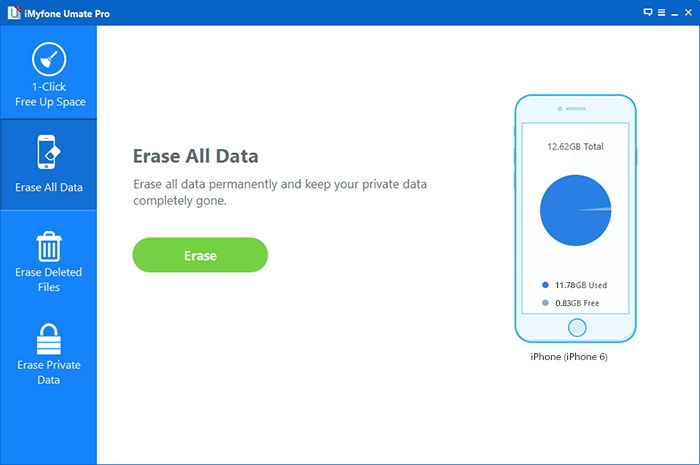 iMyFone Umate Pro can not only erase all data on you device, but also can detect and find the deleted files which still exist on your iPad or iPhone, and you can delete them with just few steps. This would ensure that all the files and settings are deleted securely to prevent privacy leak. The most important feature is that iMyFone Umate Pro can erase all data safely, once the data is erased, it is impossible to recover, even with advanced data recovery tool. But if you reset your device from Settings, the data may still be retrieved with some data recovery tools, like iMyFone D-Back.